Game of Thrones officially returns this Sunday, and nothing goes better with "game day" than wings -- just ask a sports fan. 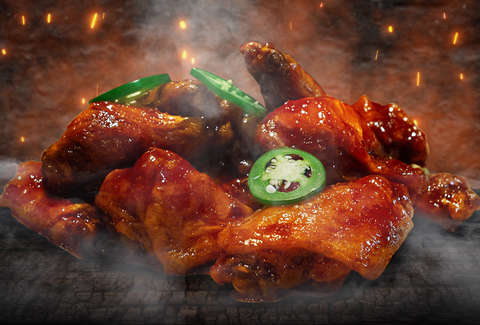 Fortunately, Buffalo Wild Wings is unleashing spicy new show-themed chicken wings for the occasion that are so hot they’re basically (spoiler alert) the Sept of Baelor in Season 6, Episode 10. BWW’s Dragon Fire wings will be around for one day, and one day only: Sunday, April 14, aka the day Game of Thrones’ final season premieres on HBO. The crispy wings are coated in a soy-ginger glaze made with chili and ghost peppers, according to the sports bar chain. As if that wasn’t spicy enough, they’re garnished with fresh jalapeno… hence the Dragon Fire in the name. Clearly these wings aren’t for the faint of heart, so all you Samwell Tarlys out there may want to sit this one out. While B-Dubs’ Dragon Fire wings won’t be around for long, you can stretch its spicy new sauce out for at least a few episodes. The wingery has teamed up with DoorDash, making it possible for wing-obsessed Thrones fans to order up the sauce for delivery through the service. Unfortunately, they won’t be arriving on the backs of one of Daenerys’ dragons. They’re probably busy. It’s been said that “in the game of thrones you live or you die,” but in the game of intensely spicy and delicious wings, it’s probably safe to say everyone wins.